Construction continues on New Lebanon School in the Byram section of Greenwich, Conn. Tuesday, Aug. 7, 2018. 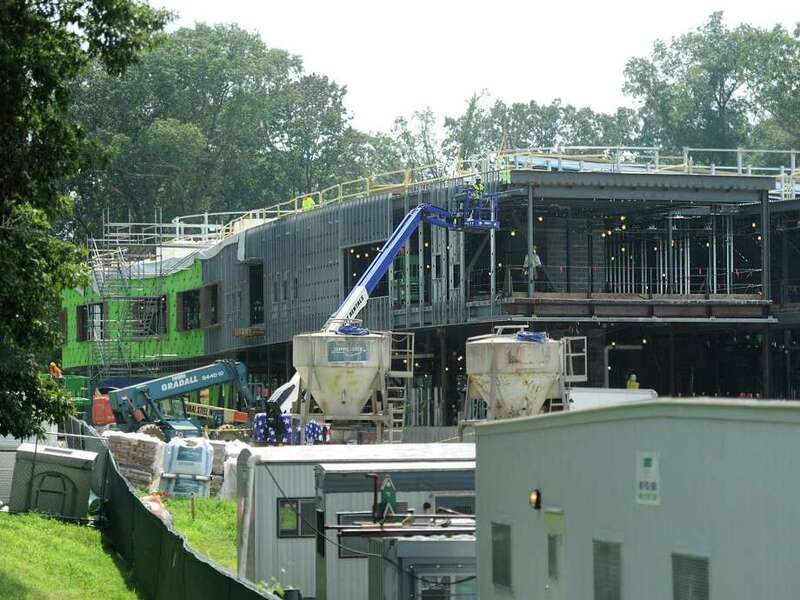 GREENWICH — Work on the new building for New Lebanon School continues on-schedule and on-budget, Committee Chairman Stephen Walko said Tuesday. The town’s goal is to have a watertight building by September and a temporary certificate of occupancy by December so students can move in when they return from winter break on Feb. 19, 2019, the chairman said. Construction workers are now building walls now that the steel frame is in place. June’s topping-off ceremony commemorated that work. As construction moves inside, noise levels for students returning to school will drop, he said. This summer, Gilbane Building Co. laid the concrete flooring for the ground and second stories, according to the monthly community update. The workers also finished trenching for water and natural gas. The new school’s roof is almost complete, Walko said. Workers have started installing mechanical ductwork — plumbing and wiring — in areas covered with a roof, but the process is ongoing, he said. Gilbane is still installing the water service on Richard Street, so the orange safety fence will stay in place until the water connection is completed. Furniture, fixtures and equipment bid packages have been advertised, and proposals are due early this month so the committee can select contractors in the coming weeks. Even the summer’s rain has not dampened the New Lebanon building process: “Gilbane has done an excellent job in managing timelines and the schedule,” Walko said. The February move-in date is still months ahead of when the site will be completed in September 2019, Walko said. The finishing touches include demolishing the current school, which will become parking, and clearing the field in front of the new building.